Hip Arthroscopy is a relatively new surgical procedure that I have had sub-specialty training in during my sports medicine fellowship. New technological advances and instruments have changed this procedure over the last several years allowing similar interventions to those previously only possible in the shoulder and knee. You no longer have to live with problems that could not be addressed with minimally invasive surgery. During hip arthroscopy I insert a small camera, called an arthroscope, into your hip joint. Another portal is used to introduce miniature surgical instruments to fix labral tears, loose bodies, and bony impingement. Hip arthroscopy has been performed for many years, but is not as common as knee or shoulder arthroscopy. Few surgeons have subspecialty training in hip arthroscopy and it is best performed by a surgeon who has extensive experience and training in the field. 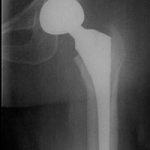 femoral head, which is the upper end of the femur. A smooth tissue called articular cartilage covers the surface of the ball and the socket. It creates a frictionless surface that helps the bones glide easily across each other. The acetabulum is ringed by a strong fibrocartilage called the labrum. The labrum forms a gasket around the socket. Why should I consider hip arthroscopy? I may recommend hip arthroscopy if you have a painful condition that does not respond to non-surgical treatment such as rest, physical therapy, and medications or injections that can reduce inflammation. Inflammation is one of your body’s normal reactions to injury or disease. In an injured or diseased hip joint, inflammation causes swelling, pain, and stiffness. Hip arthroscopy may relieve painful symptoms of many problems that damage the labrum, articular cartilage, or other soft tissues surrounding the joint. It is very important to realize that degenerative arthritis cannot be helped by hip arthroscopy. Often patients may come for hip arthroscopy as a minimally invasive alternative to hip replacement. The indications for each surgery are very different. Femoroacetabular impingement (FAI) is a disorder where bone spurs (bone overgrowth) around the socket or the femoral head cause damage to the joint. 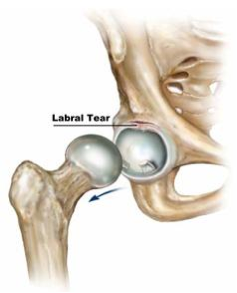 Labral tears: The ring of tissue around the hip may tear with a sports injury. You will need a thorough evaluation to determine if you are a good candidate for this type of surgery. Often an injection under fluoroscopy (xray) of a local anesthetic (lidocaine) and cortisone (an anti-inflammatory steroid) is warranted. You should have at least temporary relief from the injection if the pain is coming from inside your hip. The cortisone may give you lasting relief. If your pain returns after the medications wear off you may be a good candidate for surgery. If you are considering surgery you will need to see your primary care doctor for clearance and a possible work-up. Even though this is minimally invasive surgery (there are 2 tiny incisions) and you will be able to leave an hour or two after surgery we are working in a sensitive area and doing the same surgery that used to require large incisions. Therefore, I would like to make sure you are medically fit for the surgery. Before the operation, you will also be evaluated by a member of the anesthesia team. Hip arthroscopy is commonly performed under general anesthesia, where you go to sleep for the operation. Regional anesthesia, such as spinal or epidural, can also be used. With regional anesthesia, you are awake but your body is numb from the waist down. Your anesthesiologist will talk to you about which method is best for you. At the start of the procedure, your leg will be put in traction. This means that your hip will be pulled away from the socket enough for me to insert instruments, see the entire joint, and perform the treatments needed. After traction is applied, I insert the tiny camera into your hip. Through the arthroscope, I can identify damage to the structures in your hip. The length of the procedure will depend the amount of work to be done but in general is 1-3 hours. Complications from hip arthroscopy are uncommon. Any surgery in the hip joint carries a small risk of injury to the surrounding nerves or vessels, or the joint itself. The traction needed for the procedure can stretch nerves and cause numbness in the groin, but this is usually temporary. I use a special traction device and large pillow to minimize the chance of this occurring. There are also small risks of infection, as well as blood clots forming in the legs (deep vein thrombosis). After surgery, you will stay in the recovery room for 1 to 2 hours before being discharged home. You will need someone to drive you home and stay with you at least the first night. You can also expect to be on crutches, or a walker, for some period of time. This is not the same as knee surgery which has an easy recovery. Hip surgery is similar to shoulder surgery in that it takes much longer to recover and is much more sensitive than the knee. However the results justify the recovery process and should give you much better function and pain relief for years to come. A very specific rehabilitation program is available on this website based on your exact surgery and must be followed by your therapist. Crutches are necessary initially to rest your hip, but only for a short period of time. Physical therapy is necessary to achieve the best recovery. Specific exercises to restore your strength and mobility are important. Your therapist can also guide you with additional do’s and dont’s during your rehabilitation. Please visit our information on hip rehabilitation here. Many people return to full, unrestricted activities after arthroscopy. Your recovery will depend mostly on the type of damage that was present in your hip. For some people, lifestyle changes are necessary to protect the joint. An example might be changing from high impact exercise (such as running) to lower impact activities (such as swimming or cycling). Sometimes, the damage can be severe enough that it cannot be completely reversed and the procedure may not be successful. Hip replacement may be necessary to gain full function back but I hope to delay that by several years through this surgery if there is extensive damage to your cartilage. The labrum is an important anatomic structure in the hip. 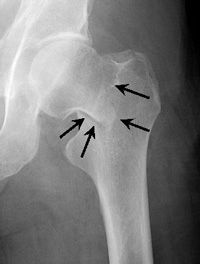 It is located at the periphery of the “socket” part of the hip joint. One can think of the hip as a “ball” and “socket” type of joint. The labrum is a band of tissue that is firmly adhered to the periphery of the socket. Think of the labrum as an “o-ring” type of structure which seals the ball into the socket. How does the labrum tear? The labrum can tear from a traumatic event such as a slip and fall, a tackle during sports, or any awkward twisting movement of the hip. The most common cause of labral tears is related to abnormally shaped hip bones. 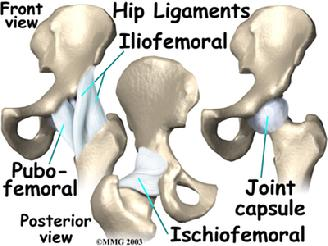 This is called Femoroacetabular Impingement (FAI) commonly called hip impingement. Hip impingement is a common problem that leads to a constellation of problems in the hip, and in many people eventually can cause symptoms that lead them to seek medical treatment. Tears of the labrum usually manifest with pain in the front of the hip joint area (“groin pain”). This may be accompanied with pain on the outside of the hip and feelings of discomfort “deep” in the hip socket. Usually when pain is present at the buttock, low back, or back of the hip it is usually referred pain from the lower back area (a “pinched nerve”). Important questions include the exact location of the pain. What makes the pain worse? What activities are made difficult because of the pain? How long has it been present? What has been done to alleviate the pain and symptoms – medication, physical therapy, stretching, etc? Please write down any details that you think may also be important so that you do not forget them at the time of your visit. xrays can give critical information about the condition of your hip. Xrays can show the presence and degree of arthritis in the joint, as well as the shape of the hip that can suggest impingement or dysplasia. Often we need to obtain an MRI to see the underlying injuries such as labral tears which do not show up on xrays. 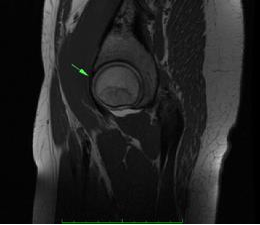 MRI’s have been found to be particularly good for diagnosing labral tears in the hip joint. The MRI is ordered with a gadolinium arthrogram. (Injecting dye into the hip prior to the MRI). The dye enhances MRI accuracy. Sometimes a CT scan can be formatted to create a 3-D reconstruction of the shape of your hip. This can serve as a “road-map” of your hip that can exactly plan surgery. Conservative treatment: Surgery should be used only after we are convinced that your symptoms are not improving with conservative measures. Rarely hip arthroscopy is urgent (examples include an infection of the hip joint, or when the labrum causing the hip to “lock”). Activity modification: This means to stop doing the things that aggravate your hip. Athletes may have to cross train so that healing can occur. This may mean a complete cessation of sport for a set period of time. Steroid injection: A single steroid injection into your hip (with xray guidance) can help calm the inflammation and enable you to being rehabilitation. A good temporary response to the injection is confirmatory as to the nature of your problem. This is both a diagnostic and therapeutic test. I do not repeat the injection more than once a year at most as repeated injections can break down the joint. Physical Therapy: The hip is a sensitive joint and aggressive physical therapy can result in a worsening of symptoms. After a brief period of rest and resolving the inflammation in your hip, you can start a progressive course with a qualified therapist. Pilates can be very helpful in strengthening your core and hips, but extreme poses and stretches in yoga can aggravate or even cause the injury. Not all patients with labral tears need surgery. If you have unremitting hip/groin pain, MRI confirmation of a labral tear, and you have failed conservative treatment options you may be a candidate for arthroscopy. Hip arthroscopy is the least invasive way to treat labral tears. Hip arthroscopy is a minimally invasive procedure to take care of problems in the hip. A labral tear is one of the best indications for hip arthroscopy. Hip arthroscopy involves placing an tiny camera into the joint, and identifying the tear. The tear is either repaired or trimmed (debrided). The majority of the time the labral tear is not amenable to repair and must be trimmed to restore the function of the hip. If an arthroscopic labral trimming is performed then the recovery is much quicker for a repair. A patient with a labral trimming will be on crutches for 1-2 weeks, whereas the patient with the labral repair will require 4-6 weeks on crutches. 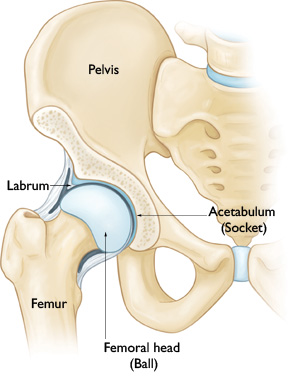 Femoro Acetabular Impingement (FAI) is a condition where the bones of the hip are abnormally shaped. Because they do not fit together perfectly, the hip bones rub against each other and cause damage to the joint. What are the types of FAI? Pincer. This type of impingement occurs because extra bone extends out over the normal rim of the acetabulum. The labrum can be crushed under the prominent rim of the acetabulum. Pincer impingement is rare as an isolated condition. Cam. 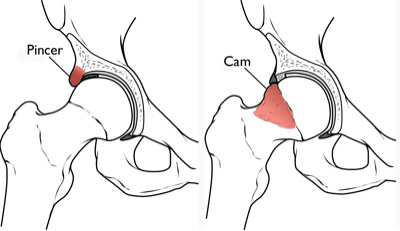 In cam impingement the femoral head is not round and cannot rotate smoothly inside the acetabulum. 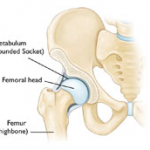 A bump forms on the edge of the femoral head that grinds the cartilage inside the acetabulum. Cam impingement is very common. Combined/Mixed. 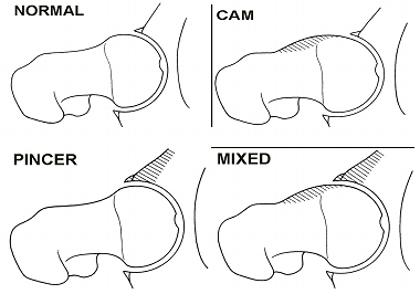 Combined impingement just means that both the pincer and cam types are present. It is not known how many people may have FAI. It is very common in soccer and hockey players. Some people may live long, active lives with FAI and never have problems. When symptoms develop, however, it usually indicates that there is damage to the cartilage or labrum and the disease is likely to progress. Symptoms may include pain, stiffness, and limping. It is important to diagnose and intervene before cartilage damage has an irreversible effect on joint function. FAI occurs because the hip bones do not form normally during the childhood growing years. It is the deformity of a cam bone spur, pincer bone spur, or both, that leads to joint damage and pain. Sometimes, you can just back off on your activities, let your hip rest, and see if the pain will settle down. Over-the-counter anti-inflammatory medicines (ibuprofen, naproxen) may help. If your symptoms persist, you will need xrays and possibly a special MRI with intra-articular contrast injection to determine the cause of your pain and provide treatment options. The longer painful symptoms go untreated, the more damage FAI can cause in the hip joint. Impingement Test: I will bring your knee up towards your chest and then rotate it inward towards your opposite shoulder. If this recreates your hip pain, the test result is positive for impingement. A number of maneuvers can help determine the cause of pain in your hip. Activity changes. Simply changing your daily routine and avoiding activities that cause symptoms can sometime be enough. Non-steroidal anti-inflammatory medications. Drugs like ibuprofen can be provided in a prescription-strength form to help reduce pain and inflammation breaking the cycle of inflammation and recovery. Surgical Treatment:If tests show joint damage caused by FAI and your pain is not relieved by nonsurgical treatment, you may benefit from surgery. Many FAI problems can be treated with arthroscopic surgery. Arthroscopic procedures are done with small incisions and thin instruments. During arthroscopy, I repair or clean out any damage to the labrum and articular cartilage. I correct the FAI by trimming the bony rim of the acetabulum and also shaving down the bump on the femoral head. Surgery can successfully reduce symptoms caused by impingement. Correcting the impingement can prevent future damage to the hip joint. However, not all of the damage can be completely fixed by surgery, especially if treatment has been put off and the damage is severe. It is possible that more problems may develop in the future. While there is a small chance that surgery might not help, it is currently the best way to treat painful FAI. May be due to an external cause (such as snapping of the Ilio-Tibial band or gluteus maximus over the greater trochanter) or internal cause (eg, snapping of the iliopsas tendon over the iliopectineal eminence [most common], aceta bular labral tear, or intra-articular loose body). A tear to the oblique abdominal muscles that does not create a hole in the abdominal wall, therefore no bulge appears under the skin (unlike a traditional hernia which has a “buldge”). Caused by the oblique abdominal muscles which attach at the pubis in the groin. The obliques contract and pull up on the pubis as the trunk flexes and rotates. 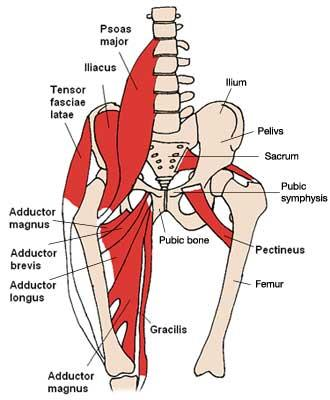 The adductor muscles also contract creating a tug-of-war with the pelvis. 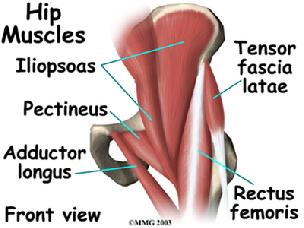 The adductor muscles are stronger in athletes and the oblique muscles tear causing a Sports Hernia. Surgical repair of torn muscle followed by structural rehabilitation (A General Surgeon does this). Hip arthroscopy is reserved for patients who have recalcitrant symptoms resistant to non-operative treatment, and clearly identifiable pathology based upon their clinical exam and radiographic studies. Total hip replacement is a very common orthopaedic procedure. As the population ages, it is expected to become even more common. Hip replacement surgery involves removing the top of the femur and replacing the ball-and-socket mechanism of the hip with artificial implants. This relieves pain and improves mobility. Minimally invasive hip replacement allows me to perform the hip replacement through a small incision but more importantly without cutting extra tendons and muscle. Patients have less pain compared with traditional hip replacement surgery, and rehabilitation is faster. Osteoarthritis of the hip is the most common reason for a hip replacement. Osteoarthritis is caused by the wear and tear of aging. It causes the cartilage covering the joint surfaces to wear out, resulting in pain and stiffness. Other conditions that can cause destruction of the hip joint include loss of the blood supply to the head of the thighbone (osteonecrosis), rheumatoid arthritis, injury, infection, and developmental abnormalities of the hip. Hip arthritis typically causes pain that is dull and aching. The pain may be constant or it may come and go. Pain may be felt in the groin, thigh, and buttock, or there may be referred pain to the knee. Walking, especially for longer distances, may cause a limp. Some patients may need a cane, crutch, or walker to help them get around. Pain usually starts slowly and worsens with time and higher activity levels. Patients with hip arthritis may have difficulty climbing stairs. Dressing, tying shoes, and clipping toenails can be difficult or impossible. Pain may also interfere with your sleep. 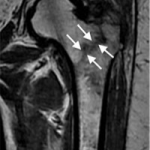 X-rays show a loss of the cartilage space in the hip socket and a “bone-on-bone” appearance. Bone spurs and cysts are common. Sometimes, I may recommend additional tests to confirm the diagnosis, including magnetic resonance imaging (MRI) or computed tomography (CT) scans, or an injection under fluoroscopy (xray guidance). Hip Arthitis: For hip arthritis, the first treatment is over-the-counter, anti-inflammatory medications, such as ibuprofen. Some nutritional supplements, including glucosamine, may also provide some relief. There is little scientific evidence to support these supplements, but some patients appear to have pain relief from them after several months of use. Short-term physical therapy may help improve strength and reduce stiffness. Advanced Arthitis: For patients with more advanced arthritis, a cane in the hand opposite the affected hip can help transfer weight away from the painful hip and improve walking ability. Arthritis, however, is progressive. Even with treatment, it will worsen over time. Weight loss can help decrease stresses on all of the joints. Worsening Pain: Pain and mobility may worsen with hip osteoarthritis, even when all of the recommended nonsurgical treatments have been tried. If this happens, Surgical options include: Arthroscopy. Arthroscopy of the hip is a minimally invasive, outpatient procedure that is relatively new. Please see the page on Hip Arthroscopy. Traditional Hip Replacement: Traditional hip replacement surgery involves making a 10- to 12-inch incision on the side of the hip. The muscles are split or detached from the hip, allowing the hip to be dislocated.The ball at the top of the thighbone is removed. The hip socket is prepared by removing any remaining cartilage and some of the surrounding bone. A cup-shaped implant is then pressed into the bone of the hip socket. A smooth plastic bearing surface is then inserted into the implant so the joint can move freely.Next, the femur is prepared. A metal stem is placed into the femur to a depth of about 6 inches. The stem implant is either fixed with bone cement or is implanted without cement. Cementless implants have a rough, porous surface. It allows bone to adhere to the implant to hold it in place. A metallic ball is then placed on the top of the stem. The ball-and-socket joint is recreated. Minimally Invasive Hip Replacement: Minimally invasive hip replacement surgery allows me to perform the hip replacement through a smaller incision. Both traditional and minimally invasive hip replacement procedures are technically demanding. They require that the surgeon and operating team have considerable experience. The artificial implants used for the minimally invasive hip replacement procedures are similar to those used for traditional hip replacement. Specially designed instruments are needed to prepare the socket and femur and to place the implants properly. The surgical procedure is similar, but there is less soft-tissue dissection. A single minimally invasive hip incision may measure only 3 to 6 inches. It depends on the size of the patient and the difficulty of the procedure. The incision is usually placed over the outside of the hip. The muscles and tendons are split or detached, but to a lesser extent than in the traditional hip replacement operation. They are routinely repaired. This encourages healing and helps prevent dislocation of the hip. I spare the piriformis and quadratus with this approach. What are the benefits of minimally invasive hip replacement? Hospital stays are shorter: For traditional hip replacement, hospital stays average 4 to 5 days. Many patients need extensive rehabilitation afterward. With less-invasive procedures, the hospital stay may be as short as 1 or 2 days. In addition, new implant designs and materials are being developed to facilitate hip surgery and prolong the lifespan of replacements. A hip fracture is a break in the upper femur (thigh) bone just before it joins the pelvis. The type of surgery used to treat a hip fracture is primarily based on the bones and soft tissues affected or on the level of the fracture. What is the normal anatomy of the hip? Hip fractures most commonly occur from a fall or from a direct blow to the side of the hip. Some medical conditions such as osteoporosis, cancer, or stress injuries can weaken the bone and make the hip more susceptible to breaking. In young patients more force is required to break the hip. The patient with a hip fracture will have pain over the outer upper thigh or in the groin. There will be significant discomfort with any attempt to flex or rotate the hip. The leg may appear to be shorter than the noninjured leg. The patient will often hold the injured leg in a still position with the foot and knee turned outward (external rotation). 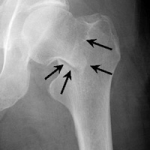 Imaging: The diagnosis of a hip fracture is generally made by an X-ray of the hip and femur. 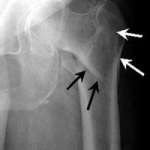 In some cases, if the patient falls and complains of hip pain, an incomplete fracture may not be seen on a regular X-ray. In that case, magnetic resonance imaging (MRI) may be recommended. The MRI scan will usually show a hidden fracture. If the patient is unable to have an MRI scan because of an associated medical condition, computed tomography (CT) may be obtained instead. 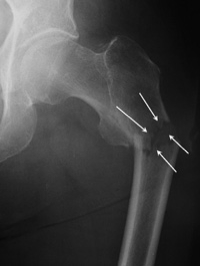 This fracture occurs below the lesser trochanter, in a region that is between the lesser trochanter and an area approximately 2 1/2 inches below. Intracapsular Fracture. This fracture occurs at the level of the “neck” of the bone and may have loss of blood supply to the bone. Considerations: Once the diagnosis of the hip fracture has been made, the patient’s overall health and medical condition will be evaluated. In very rare cases, the patient may be so ill that surgery would not be recommended. In these cases, the patient’s overall comfort and level of pain must be weighed against the risks of anesthesia and surgery. Most surgeons agree that patients do better if they are operated on fairly quickly. It is, however, important to insure patients’ safety and maximize their overall medical health before surgery. Your internist or family doctor will evaluate you and may mean taking time to do cardiac and other diagnostic studies. Most problems around hip fractures are not related to the surgery but rather to the associated medical problems and conditions. Nonsurgical Treatment: Patients who might be considered for nonsurgical treatment include those who are too ill to undergo any form of anesthesia and people who were unable to walk before their injury and may have been confined to a bed or a wheelchair. What is the surgical Treatment? Hemiarthroplasty is a type of hip replacement in which only the “ball” of the hip is replaced. patients will receive antibiotics during surgery and for the 24-hours afterward. 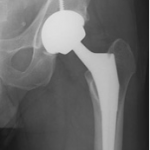 Intracapsular Fracture – Young Patients: If the intracapsular hip fracture is displaced in a younger patient, a surgical attempt will be made to reduce, or realign, the fracture. The fracture will be held together with either individual screws or with the larger compression hip screw. In these cases, the blood supply to the ball, or head of the femur, may have been damaged at the time of injury. Even though the fracture is realigned and fixed into place, the cartilage and underlying supporting bone may not have adequate blood. This may cause the femoral head to flatten out. When this occurs, the joint surface becomes irregular and requires replacement. Intracapsular Fracture – Older Patients: In an older patient, the chance that the head of the femur is damaged in this way is higher. 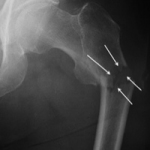 Patients will recover quickly if some of the components of the hip are replaced. In some cases, this can mean a replacement of the ball, or head of the femur (hemiarthroplasty). In other cases, this can mean the replacement of both the ball and socket, or head of the femur and acetabulum (total hip replacement). Intertrochanteric Fracture:Repair of an intertrochanteric fracture with an intramedullary nail. The nail is in the hollow cavity of the femur (thighbone) rather than on the side of it (as with a plate). I typically treat intertrochanteric fractures with an intramedullary nail, which also allows for impaction at the fracture site and a minimally invasive surgery with very small incisions. The intramedullary nail is placed directly into the marrow canal of the bone. A lag screw is then placed through the nail and up into the neck and head of the hip. The sliding of the lag screw and impaction of the fracture help heal the bone. You can walk right away on your repaired hip with crutches or a walker. In certain cases a plate rather than a nail is used. The plate will have screws that go into the bone from the lateral, or outer, side of the femur. A single large screw goes into the neck and the head of the femur. Secondary screws are placed through the plate into the bone to hold the fracture in place. You may be discharged from the hospital to your home but many people find that a stay in a rehabilitation facility is necessary to assist them in regaining their ability to walk. Patients may be encouraged to get out of bed on the day following surgery with the assistance of a physical therapist. The amount of weight that is allowed on the injured leg will be a function of the type of fracture and repair. The physical therapist will work with you to help regain strength and the ability to walk. This process may take up to three months but generally you feel much better than before the surgery after a few days. What medicine is it likely for me to take? Most patients will be placed on medicine to thin their blood to reduce the chances of developing blood clots for up to 6 weeks. These medicines may be in the form of pills or injections. Elastic compression stockings or inflatable compression boots are also be used. What will the follow up care look like? During the appointments that take place after surgery, I will check the wound, remove sutures, follow the healing process using X-rays, and prescribe additional physical therapy, if necessary. Following hip fracture surgery, most patients will regain much, if not all, of the mobility and independence they had before the injury. More than 353,000 people are hospitalized for hip fractures each year. The total cost in medical bills and lost income resulting from hip fractures is more than $12.6 billion a year or an average of $37,000 per hip fracture. Because of the aging U.S. population, the number of hip fractures is expected to reach 650,000 by 2050. Close to ninety percent of hip fractures are among persons 65 and older. Women over age 65 have a one in five chance of having a hip fracture during their lifetime. Age. The rate increases for people 65 and older. Gender. Women have two to three times as many hip fractures as men. Heredity. A family history of fractures in later life, particularly in Caucasians and Asians. A small-boned, slender body. Nutrition. A low calcium dietary intake or reduced ability to absorb calcium. Personal habits. Smoking or excessive alcohol use. Physical impairments. Physical frailty, arthritis, unsteady balance and poor eyesight. Mental impairments. Senility, dementia, e.g., Alzheimer’s disease. Weakness or dizziness from side effects of medication. About 24 percent of hip fracture patients over age 50 will die within 12 months after injury because of complications related to the injury and the recovery period. Most hip fracture patients who previously lived independently will require assistance from their family or home care. About half will require canes or walkers for mobility when they return home. 51 percent of hip fracture patients 65 and older are discharged from hospitals to long-term care facilities. All hip fracture patients will require walking aids for several months after injury and nearly half will permanently require canes or walkers to move around their house or outdoors. How do I prevent hip fractures? Orthopaedic surgeons are experts in the care and treatment of patients with fractured hips. We are concerned about the epidemic of hip fractures and the impact these severe injuries has on patients, their families, and on society. Prevention of hip fractures is far better, and far less costly, than treatment after the bone is broken. Pregnant or nursing women under age 19: 2,000 mg. Pregnant or nursing women 19 or older: 1,400 mg.
Menopausal, postmenopausal women not taking estrogen: 1,500 mg.
Menopausal, postmenopausal women taking estrogen: 1,000 mg.
Vitamin D plays a major role in calcium absorption and its incorporation in bone. The Food and Drug Administration’s USRDA (Recommended Daily Allowance) for vitamin D is 400 international units (IU). One glass of milk contains 100 IU. I recommend an increase in your intake of vitamin D after menopause. Exercise:Exercise to minimize bone loss. You should engage in weight-bearing exercises, such as walking, jogging, hiking, climbing stairs, treadmill exercises, and weight training. Consult your primary care doctor before beginning any vigorous exercise program. Begin exercising slowly, especially if you have been inactive. Start with short periods of about 10 to 15 minutes 3 times a week and build up slowly, adding a few minutes each week. You can build up to exercise periods of 25 to 60 minutes, three or four times a week. Talk With Your Doctor: Proper diagnosis and early treatment can help reduce the risks of osteoporosis. Consult your primary care doctor because a treatment must be prescribed individually. Treatment plans should be initiated early because once bone is lost it is difficult to replace. Tobacco and alcohol: Eliminate smoking and excessive alcohol use which cause bone loss and increase your risk for a fracture. What can I do to my home to make it safer? I don't have any issues wearing backpacks and I have no pain in the shoulder. Dr. Barry did an amazing job and returned me back to "normal."